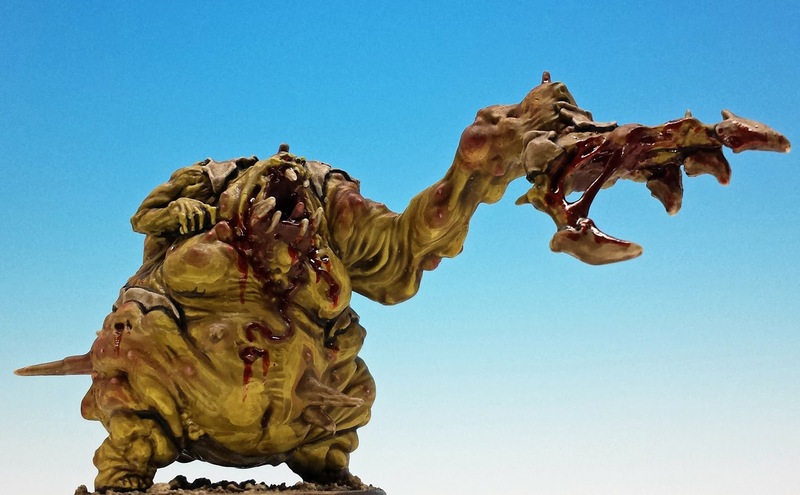 We all have bad days, but can you imagine waking up every day as a morbidly obese zombie? They way people judge your eating habits? The dietary imperatives? The stigma? 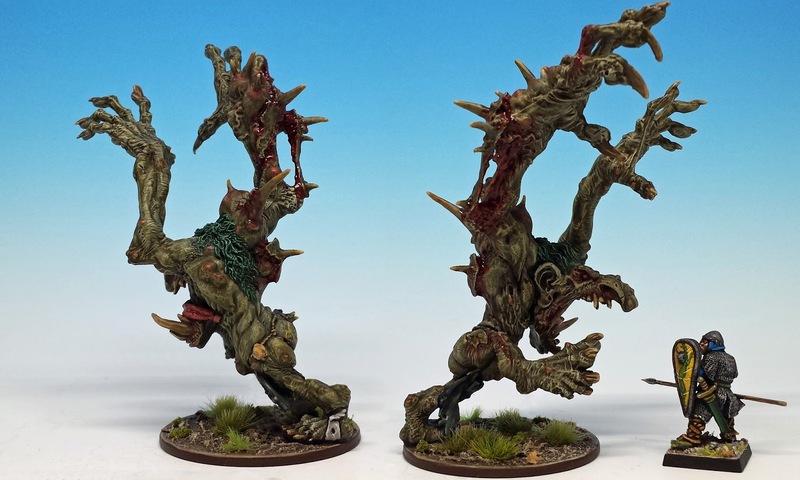 These were my thoughts as I painted the miniatures in the "Zombie Bosses Abomination Pack" for Zombicide Black Plague. The core Black Plague set contains one beefy zombie leader or "Abomination" -- but with this expansion you get three more: the Ablobination (pictured above), the Abominotaur and the Abominatroll. After painting all sorts of miniatures for Saga Revenants and The Terror of the Lichemaster, I was on a real zombie jag, and I started casting around for another game where I could use a few dozen Dark-Age undead. It didn't take me long to find Zombicide: Black Plague. And to know the game is to love it... it's fast, bloody and unpredictable. It plays well solo, and is just as fun with 4 or 5 drunk friends. It's also one of the best games I know for naturally breeding a sense of story. Every session seems to generate its own drama: last stands, sudden break-outs, cowardly escapes. The zombie bosses add a new peril to this sense of drama. They are enemies that are not so much to be fought as to be avoided at all costs. Indeed, they are often unkillable. Their power within the game is nicely mirrored by the miniatures themselves: they are gigantic and ripple with active, unbounded violence. 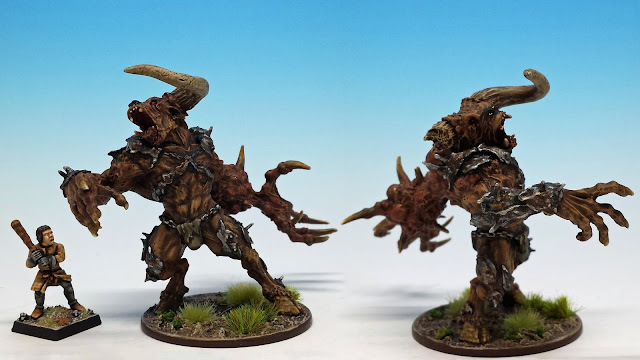 Every muscle in the Abominotaur's body is coiled in one wrenching blow. And the Abominatroll moves with a wonderful sense of speed -- he is sprinting so quickly that his tongue is flapping behind him like a pennant (see the picture below). All these Abominations also all have a real sense of affliction. Their bodies are boiling with tumors and in places the skin lifts right off the muscles in gooey sheets. Spikes and bone spurs shoot through their flesh and limbs become grotesquely swollen. 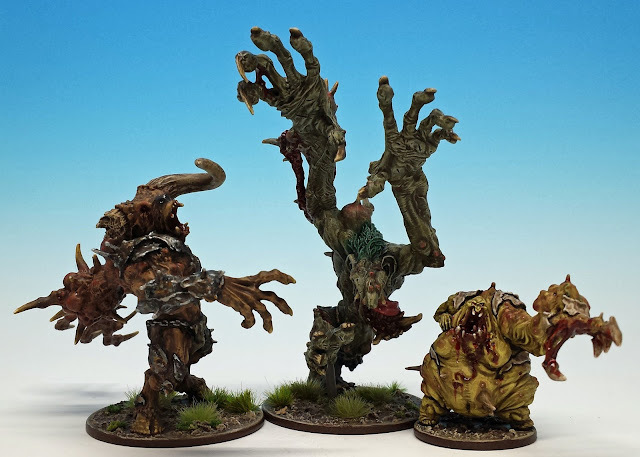 Games like Descent have made me quite skeptical of the plastic miniatures one generally finds in board games, but I have to say that these figures from Cool Mini or Not are top notch. 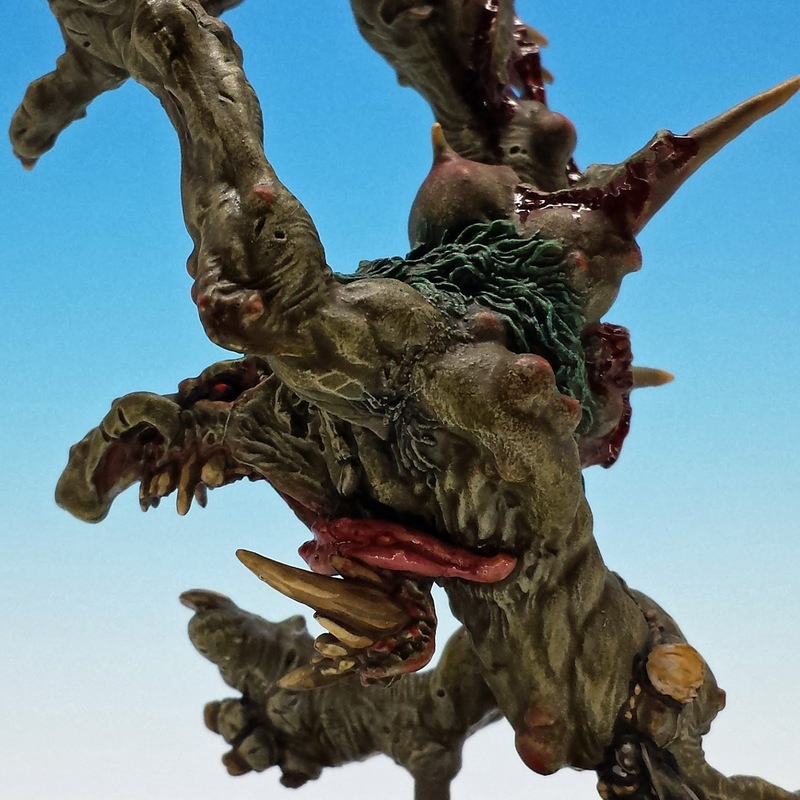 Although the smallest of the three zombie bosses, the pièces de résistance is the Ablobination. The level of realistic anatomical detail in his sculpture is impressive and unsettling. His skin alternates between saggy wattles (as in his left arm) and chubby, almost baby-like curves (as in his knees and buttocks). I had a ton of fun painting him -- the acne, the gore spilling out of his mouth, the cellulose, the varicose veins, the weeping goiters. I hope you are disgusted! Sorry, you asked for it 😉. Oh sweet Odin!!! Fantastic work sir! A Nightmares come true! I think the thing that I like about Black Plague is that it doesn't deliberately script dramatic moments -- they just sort of naturally happen. Not that scripted events are bad either (Dead of Winter is a good example of carefully scripting wonderful story events). I did the same thing with Black Plague! Had to have that fantasy zombie horde! They got me with green horde to! AAAAAAAAAGGGGH! Love these. I'm feeling guilty, mine are still in the loft. I'm a bit peckish now. Biliously amazing! The Ablobination is definitely the best of the three, simply for pure gross out value. "And to know the game is to love it [...] fun with 4 or 5 drunk friends [...] Every session seems to generate its own drama: last stands, sudden break-outs, cowardly escapes." One of the very best nights of my life was spent playing a round of zombiecide. It really can be THAT fun with a little alcohol mixed in. Wow. Jaw dropping. As everybody else said, these are the most gruesome beauties you can find. Absolutely great. I did the same thing with Black Plague!